At my rabbinic ordination, twenty six years ago, my father delivered the sermon on the weekly portion, which we read again this Shabbat—Beha’alotechah. In recent days, I’ve often reflected on this passage that launched me into the rabbinate, for this month marks my twentieth anniversary as your rabbi at Ahavath Beth Israel. During my two decades here, my father’s words have proven prophetic. Together, we have shared joy and sorrow, and you have been my family and my teachers throughout. This community has loved and supported me through thick and thin: I have raised my children here, divorced and remarried, mourned my father’s death and celebrated births, Bat Mitzvahs and graduations. When I arrived in June of 1994, I was still, on occasion, told, “You seem too young to be a rabbi.” I suppose that one of the perks of middle age, with its sundry aches and pains, is that at least I now look the part. Throughout this time, it is been an enormous honor to share in your lives. Dad was right: you have been generous beyond measure. It is a rabbi’s unique privilege to be with his or her community in the most significant moments in their lives. You have taught me so much Torah in our time together. In you, our tradition lives, as flesh and blood. Together, we have experienced pleasure and pain and everything in between, and through all of it, sought meaning and even, I daresay, holiness. For my failures, I ask your forgiveness. And for your gifts, I offer my thanks. Next Shabbat, we will begin the book of Numbers, which is known in Hebrew as B’midbar, meaning “in the wilderness.” That is also the name of the week’s portion, and, in a sense, it captures the theme of the book as a whole, which focuses on the narrative of our wanderings, between leaving Egypt and arriving in the Promised Land. Our Rabbis ask: “Why was Torah given in a wilderness?” and the Talmud, in Nedarim 55a, answers that if we want to learn Torah, we have to emulate the terrain where it was given, by making ourselves open and ownerless. As the commentary in Etz Hayim notes: It is intimidating to open oneself to the demands of God, to a new and morally demanding way of life. Torah portrays the people as periodically wishing they were back in the predictable, morally undemanding servitude of Egypt. Yet Israel’s willingness to accept the Torah, to be open as a wilderness, was the essential first step in God’s remaking the world. Perhaps this kind of openness is the prerequisite for all real learning and personal growth. If we wish to move forward, it is important to be able to let go of our hardened assumptions and be willing to let the world act upon us in new ways. Many of us find it easier to do just this when we take time to experience the power of wild places. In this spirit, Rabbi Lawrence Kushner offers a related insight into the connection between Torah and wilderness: The reason Sinai is so special and the reason why we are unable to hear Torah all the time, suggests Eliyahu KiTov, is because the noise, static, and muzak of this world drown out the sound of God’s voice. At Sinai, not a bird chirped or a sound [other than God’s voice] was heard. At Sinai we could hear what had been there (and continues to be here) all along. We all have our own personal Sinai spaces and times, where we are able to step away from the chatter of daily live and reflect on what matters most. 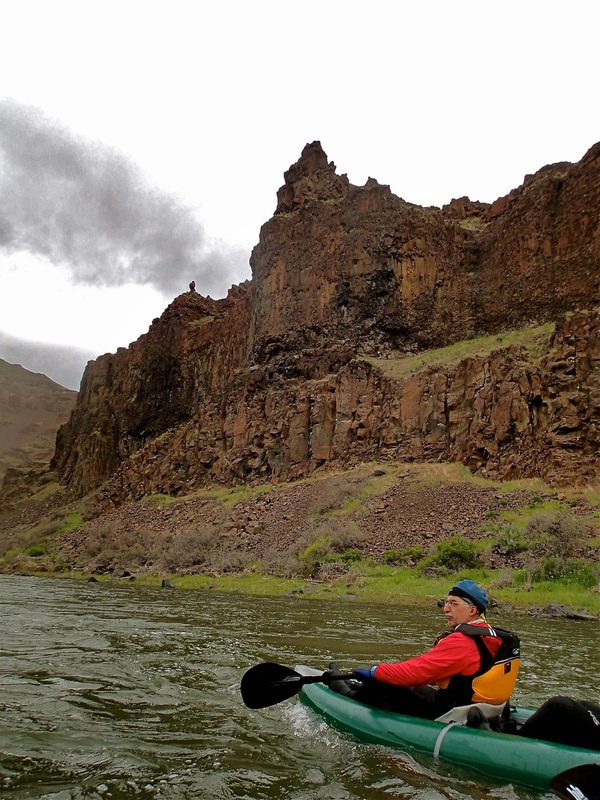 A few weeks ago, I went paddling in Oregon’s John Day Wilderness, spending three days and seventy miles with good friends and colleagues. We didn’t see or hear another soul the entire time. And in the quiet of the canyon, or sitting together by a campfire, we heard God’s voice, in our own conversations with one another and with ourselves, and in the spaces between those conversations. Not all of us can—or wish to—take time off the grid. But even if we do not leave our homes, we can create our own wilderness times, disconnecting from the world of technology and reconnecting with God, with family, and with our own still, small voices of conscience and vision. Henry David Thoreau famously declared: “In wildness is the preservation of the world.” As we enter the wilderness this week with portion B’midbar consider ways that you might make yourself more open, more ownerless, and more still, like that sacred space. Next month, here in Boise and in cities across our nation and around the globe, the lesbian, gay, bisexual and transgender communities and their friends and family will march in joyous parades commemorating LGBT Pride Month. Progressive churches, synagogues and other faithful congregations will certainly be well-represented at these events, in support of our LGBT members and our shared values of freedom, inclusion, and liberation. One of the world’s most popular Pride events takes place in Tel Aviv, Israel. Each June, the Jewish state’s most cosmopolitan city attracts over 150,000 participants to its renowned Pride parade. Tel Aviv boasts scores of gay-friendly clubs, hotels, and shops; in 2011 a global survey conducted by GayCities.com and American Airlines proclaimed it the premiere gay travel destination, over places like New York, Toronto, and Sao Paulo. This is not so surprising in a country that has, since the 1980s, allowed gays to serve openly in the Israeli Defense Forces. Yet it is quite remarkable in light of the state of gay rights (or, more precisely, lack thereof) in Israel’s neighboring nations: in much of the Arab world, gay, lesbian, bisexual and transgender people are deeply closeted, living in fear for their lives. It goes without saying that there are no Pride events in Cairo, Damascus, Mecca, or Ramallah. It is sadly ironic when those who lead the struggle for freedom fail to see it. Of course Israel has flaws. As a nation living under siege for its entire history, she has committed some human rights abuses. But her citizens overwhelmingly support the peace process as the best way to permanently secure the kind of liberties that are the foundation for things like Pride parades. America’s progressive faith communities should recognize that boycotting and protesting against the Middle East’s only democracy is no way to move the peace process forward. And so I hope and pray that as those communities rightfully march for gay rights here at home, they also gain an appreciation for the only bastion of freedom that extends those rights in the Middle East. The last Torah portion in the book of Leviticus, Bechukotai, opens with God’s conditional promise that if we follow the mitzvot, we will reap abundant reward. After a description of the bounty God bestows upon the righteous, the portion then turns to the punishments that will afflict those who do not heed God’s words: “If you fail to obey Me, I will go on to discipline you sevenfold for your sins, and I will break your proud glory. . . Your land shall not yield its produce, nor shall the trees of the land yield their food. . .” (Lev 26:18-20). The catalog of curses in this list far exceeds the aforementioned blessings, in both number and intensity; it even speaks of parents forced to eat the flesh of their own offspring. What do we make of this theology of reward and punishment? There are a couple things to note before dismissing this perspective outright. First, throughout the portion, the Torah speaks communally, to the Jewish people as a whole rather than to individuals. Responsibility is collective here: if the society as a whole is just, it will prosper, and if it is oppressive it will not stand—but within that society, certain virtuous men and women may still suffer, and others, who are malevolent, may thrive nonetheless. There is no promise that if I, as an individual, lead a moral life, I will be blessed with health and prosperity. Furthermore, this doctrine of reward and punishment only works in one direction. Even if one accepts the notion that good is rewarded and wrong-doing is punished, that does not mean that all suffering is punishment for wrong-doing. This is the failing of Job’s friends, who falsely—and arrogantly—assume that Job must have committed a sin to incur God’s wrath. Still, even with these caveats, many of us—myself included—find it difficult to accept a theology of Divine reward and punishment, even on the national level. Such a worldview fails to align with the reality we see, day in and day out. I believe that no matter how much we wish it were otherwise, sometimes the world is just not fair. And yet I still find wisdom in this week’s portion, because on an important level, environmentally-speaking, it communicates a core truth. We now know that the land and the weather do respond to our communal moral choices. The relationship is complex, and does not follow a simple equation of reward and punishment meted out by a supernatural God, but it is the way of the world. When we act responsibly, we are more likely to continue to enjoy the blessings of land and air and water. When we abuse our power over the rest of God’s creation, we are likely to incur environmental degradation, with sometimes-dire consequences. Collectively-speaking, good behavior does indeed offer benefits and irresponsibility surely carries a steep cost. This week, try to be extra-conscience about the way that you and your household live on the earth. What actions of yours constitute a blessing? A curse?